A few weeks ago, we highlighted a few of our favorite Spring items from Hobby Hill Farm in our Spring Sponsor’s Shopping Guide. One of the featured items was their embroidered Poultry in Motion baseball cap. We were delighted this week, when Hobby Hill Farm asked us if we would help launch their new Poultry in Motion t-shirts. 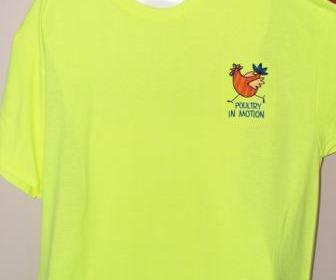 One lucky entrant will receive their very own Poultry in Motion t-shirt just in time for warmer weather. This t-shirt is sure to be a conversation starter and a wonderful addition to any chicken lover’s wardrobe. 1. You must leave a comment on this blog post for entry. Be sure to leave an email address so that we can contact you if you do not have a blog. (1 entry) If you are doing any of the below actions to increase your number of entries, please let us know in your comment(s). You can earn 4 entries in this amazing giveaway! This contest ends on Tuesday, March 13, 2012 at 11:59 pm East Coast Time. Item ships to US addresses only.